The enthralling lagoons and backwaters of Kerala attract more than ten million visitors on an annual basis. The trend of Ayurveda is still going strong in the state of Kerala and it comprises treatments like 'uzhichil' and 'pizhichil' and ailments like arthritis seem to get cured here. This is also the hub for a majority of festivals which are celebrated owing to a church or mosque found in every nook and corner. An ample amount of natural herbs offering medicinal value also find their home in Kerala: Ashwagandha, Amalaki, Katphal, Brahmi, Yashtimadhu and Sankhupushpam, to name a few. Also known as 'God's Own Country', this place is heaven for the enthusiastic travellers as it flaunts its lush green plantations, serene beaches and cool climate. This tropical paradise has delicious treats on its 'must-see' platter and you should definitely take a bite of its awesomeness! Let's dig into some of the best places. You are free as a bird to choose one of the comfortable homestays or hostels as well. But, nothing can defeat the wonderful feeling of staying in a houseboat while in Alleppey. Why are you here? Mainly to experience the backwaters, right? Begin with a delightful canoe ride which shall smoothen your way through the narrowest channels of Alleppey and you get to explore the "Venice of the East". A Shikara boat ride is even more charming as it shall also protect you from the hot sun via its roof. Another option is an overnight stay in a houseboat which includes cruising during the daylight, lunch, dinner, overnight stay as well as breakfast the next day. We have also heard praises of the local alcohol, toddy! In the mood for some spicy food? Then definitely try the toddy food shop as well. You can even treat your taste buds with the Kerala cuisine or for the more religious kinds, several unique temples and churches shall render you happy. Just arrived at the airport and feeling tired? Not to worry. Quite close to the international airport, we have Fort Kochi. You can walk around in pride as you admire the traditional customs and get a feel of the locality around. The thing that shall definitely intrigue you are the Chinese fishing nets: they are transfixed on the shore for capturing fresh fish and seafood. Tall wooden beams have extensive branches for holding the horizontal nets above the sea. The men in operation are a group of fishermen who make elegant catches slowly and steadily and you shall see the structures are pretty well managed by large stones suspended from ropes at the other end. Did you know that this unusual style of fishing was introduced by the Chinese explorers in the 14th century? Even the name 'co-chin' means 'like-China'. Kochi shall surprise you with a truckload of tourist attractions: the first European church in India which is the St. Francis Church, Bazar Road which shall introduce you to the world of spices with a tinge, step into the royal Dutch Palace where once the King of Cochin resided and, of course, the Jewish Synagogue shall turn eyeballs too as it is the only active Synagogue in the whole list of Commonwealth countries. Too much information to process? Take a dosa break at the Sri Krishna Cafe and sweep through Palace Road to Santa Cruz Basilica and arrive at Fort Kochi Beach which is equally charming. You can travel to Munnar from Fort Kochi itself in an AC Volvo bus which shall transport you to the magical haven in a matter of about 6 h. Direct buses from Eranakulam are available every hour. Munnar town is amazing for some soft and hard trekking, taking a tour of the tea factory or camping, trekking and kindling the fire of adventure in you is the best option in Munnar. And who wouldn't love taking pictures to capture all these gorgeous moments? Especially while you are driving to the picturesque places: Top Station, Mattuppetty and Devikulam. These places offer spectacular views and comprise activities like boating as well. You can have a gala time in the Meesapulimala Trekking organized by the Kerala Forest Department. Fond of dosas? Saravana Bhavan shall engage you in the longest dosa ever! We have also heard of a certain restaurant called Rapsy, which posts on its walls when you leave them a nice message in your language. That's really sweet of them! Thekkady or Periyar is around 165 km from Kochi. If you are an avid car driver, let this be one of your best car journeys of 4 h to visit the spectacular Periyar Wildlife Sanctuary. The misty mountains of the Nilgiris shall hypnotize you with its beauty while taking a boat cruise by the Periyar Lake shall rejuvenate your soul. Your heart shall cry with joy the moment you pick the elephant Safari to scoop through the wilderness or be the Braveheart to reconnoitre the lush green forests. The skilled jeep drivers are also iconic in Thekkady. Your evening shall become blissful on spending time at the Kerala martial art show which always attracts a magnanimous crowd. The easiest way to get here is via Trivandrum airport and rail which is around 20 km away. When you are frustrated with the regular humdrum of life and want to completely chill and relax, Kovalam is the perfect getaway for you. Dip your feet into the warm sand and soak in the beachy glow of Kovalam while the numerous coconut trees and fresh vegetation also add to its beauty. Take a holiday here and regain your energy with the Ayurvedic healing experts! Nilambur Road, around 53 km, is the closest railhead to Wayanad. Buses to Wayanad can be availed from all major cities in the country. The closest airport would be the Calicut International Airport. The cool weather of Wayanad is definitely a plus point along with the splendid waterfalls, caves, lakes and dams. Do take some time out and say hello to the spotted deer, Bison, Cheetah and Bears in the Muthanga Wildlife Sanctuary. This place boasts of treehouses in the jungle and also of the production of spices: tea, coffee, cardamom and pepper. The capital city flaunts of the fabulous culture which is significant in this part of the state. The uniqueness of the cultural heritage and the glorious architecture is still preserved to perfection and not tampered by rapid development. Curious about the Travancore Royal family? Do the honours by visiting the Kowdiar Palace which was their royal abode! The Varkala Beach is a happy place for most tourists. It was a guarded secret of Kerala which is no longer hidden. You could find buses from Alleppey or just for your information, it is only 40 km away from Trivandrum International Airport. See whatever works for you! Although Varkala will let you try out some fabulous henna, go for some rejuvenating yoga, shop till you drop or take a dip in the sparkling waters but nothing can substitute the thrill you shall get from the water sports in Varkala. The stand-up paddle board in the backwaters looks pretty chilling but in actual fact, it is not for the faint-hearted individual. Surfing shall really lift up your spirit and the divine sunsets shall mesmerize you. A part of the Kuttanad region, it is a group of small islands on the Vembanad Lake. It is proud to house a bird sanctuary spread over 14 acres. Egrets, herons, darters, teals, waterfowls, cuckoo, wild duck and migratory birds like the Siberian stork appear to be quite charming to the visitors. Other spots of interest include Aymanam, Pallikoodam, Kallara, Nattakom, Panachikadu Reservoir, Thazhathangadi, Thanneermukkam bund, etc. A day spent here with your loved one will give you memories for a lifetime, especially in the monsoons where you can cuddle in the houseboats and enjoy a cup of steaming hot tea. What are your views about the 'Land Of Cashews'? Also known as Quilon, this is an old seaport town situated on the Arabian coast. Present on the glistening lake of Ashtamudi, this tourist destination serves as the southern gateway to the backwaters of Kerala. This is an interesting place which was referred to as the beautiful Desinganadu and it serves two purposes. As a commercial centre as well as a beautiful city of palaces. The colourful city shall captivate your interest with beaches, waterfalls and places of worship. When you talk about industrialization, heavy minerals like ilmenite, rutile, monazite and zircon are found in large amounts. Kollam is really special in many ways. Heard about 'Leelathilakam' and 'Unnuneelisandesam'? These are two important literary gifts which the 14th century Kollam handed over to Kerala. Even Ramanattam and Krishnattam are of historical importance. Kollam district proudly ranks 7th in the state. Did you know that 'Kottayam' is referred to as the letter capital of Kerala? 100% literacy emerged from this state which lies a little south of central Kerala. As a traveller, you would love to step into this scenic place because of its picturesque landscapes, backwaters, bird sanctuaries and temples. This place is bordered by Ernakulam in the north, Idukki in the east and by Alappuzha and Pathanamthitta districts in the south. The colonial style houses in this city are a sign of elegance and Kottayam is truly renowned for its exquisite churches and numerous variety of books. Have you contemplated visiting the 1000-year old mosque in the district which sings praises of religious harmony? Kottayam is a unique gateway to the pilgrim centres of Sabarimala, Ettumanoor, Bharanganam, Aruvithura, Vaikom, Erumeli, Manarcad and Athirampuzha. Your heart shall still not get enough of Kottayam as to add on to it, there shall be ideal take off points for visits to Peermedu, Munnar, Idukki, Thekkady, Ernakulam and the temple city of Madurai. Popularly known as Palghat, this city has a lot to offer to its viewers who shall enjoy a very good time here. If we talk about the Palakkad Fort of the 18th century, it can always flaunt sturdy battlements, a moat and a lovely Hanuman temple on its grounds. One cannot take his eyes off the grand Ratholsavam chariot festival which takes place in the 15th century Viswanatha Swamy Temple located on the Kalpathy river. Heard of best out of waste? Come let us show you solid proof in the form of a rock garden in the town of Malampuzha which is made out of recycled materials. You can have a merry picnic in the Malpuzha Gardens or hire a cable car to take in the splendid views. The sparkling waters of the Dhoni Waterfalls shall relax your soul. If you turn south, the Nelliyampathy hill station shall be your wonderous visiting spot. A famous place for catching little fish is the Pothundi Dam. If you are fond of tigers and some teak plantations on the side, you can plan on visiting the Parambikulam Tiger Reserve and also be on the lookout for fascinating birds like the grey-headed fishing eagle. The massive Bekal Fort shall never fail to grab your attention because of its striking features and impressive beauty. This deems to be one of the biggest forts in Kerala and lies about 16 km to the south of the northernmost district in Kerala. 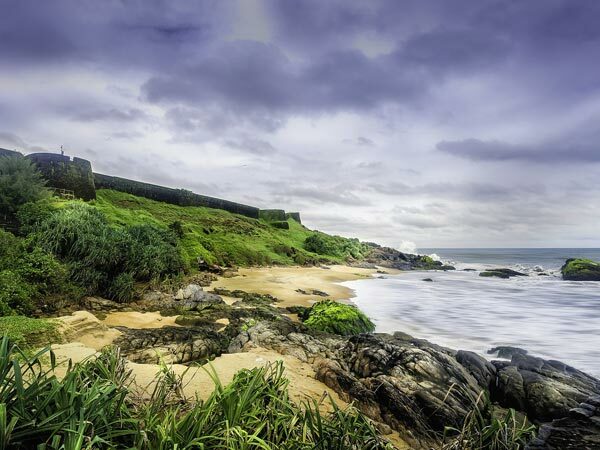 It is about 130 ft above sea level and another famous attraction around Bekal would definitely be the Bekal Fort Beach. It will offer you a taste of serenity. The fort is a marvellous building sitting on the steep hills and is carved out of laterite slabs with a polygonal shape. Why does one usually want to visit Bekal? Because it houses unique structures like an observation tower with intricate peepholes, you can bow your head at the Anjaneya Temple with its famous masonry and two Theyyam sculptures built from laterite. An architectural piece to drive you crazy is the stupendous rock garden while the ancient mosque built by Tipu Sultan is also praiseworthy. The beachside is lighted up during nightfall, which highlights it with a special aura making the place all the more beautiful. Who doesn't enjoy a jovial time with near and dear ones while having some delicious home-made food? How about exploring the picnic spot in Devikulam? 8 km away from Munnar, this place shall always occupy a special place in your memory with its tasteful variety of flora and fauna and the lush green lawns are pretty inviting too! The Sita Devi Lake is enchanting as well. Its crystal clear waters and excellent surroundings make it a lovely location to chill. Interested in some trout fish? Take out your fishing rods and get going here! Talk about the humongous business hub in the district: Sultan Bathery tops it in the Kozhikode-Kollegal National Highway. Did you know it served as the ammunition storage reservoir during the 18th century by Tipu Sultan of Mysore? 'Ganapativattom' is also another of its popular names because it has truly beautiful temples and has a charming history. The temperate climate of Sulthan Bathery and its lush greenery shall make you call up your friends and go on a relaxing picnic together. The famous Jain temple is also in the 'must-visit' places of people and so is the Ganpati Temple and Mariyamman Temple. The Wayanad Heritage Museum can also squeeze in a place in your tourist attraction list.